Spring is here, and the first thing on your mind is cleaning your windows…NOT! Obviously you’d like to be outside doing something more enjoyable, but once the job is done, and you can actually see through your windows, it feels so good and you have a great sense of accomplishment. The key to getting your windows ready for the summer is simply getting it done, don’t put it off, stop looking for excuses for not doing it, stop procrastinating…you know you’ll be happy you did. 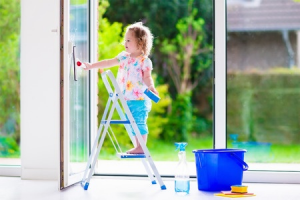 To help you in your quest for clean windows the easiest way possible, I’ve compiled a few tips to help you get the job done. Begin by choosing the right weather. Wrong: Choose a sunny day for your project. Contrary to what some people think, a bright sunny day isn’t necessarily ideal for cleaning windows. Too much sun dries your cleaning solution too fast which results in streaks and smears. A good squeegee, preferably one with an adjustable handle. Make sure the rubber on your squeegee is in good condition, it can show signs of wear after several uses, and will do a less than perfect job. A bucket, a good sponge and several clean cloths. Microfiber cloths do a great job and leave less lint. A window scraper to remove hardened on substances such as paint, “bird bombs”, dried on insects or any other things that might need a little elbow grease. 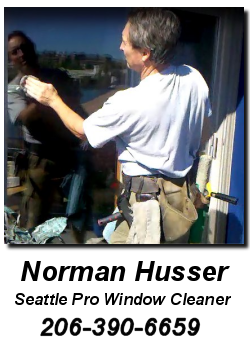 A soft bristled brush to clean off loose debris that has built up on your windows, inside and out. Clean the interior windows first. Using the squeegee: Don’t start with a dry squeegee, make sure it’s a little bit wet. After you have washed your window, beginning at the top corner of your window, pull the squeegee down the window in a straight line to remove the cleaning solution. Repeating while working your way across. In order not to leave strips of soapy solution, overlap your strokes, and be sure to wipe the excess water and solution from your squeegee with every swipe. 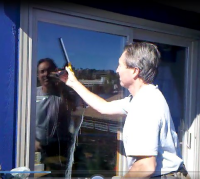 Once you have completed this step, run your squeegee horizontally at the bottom of the window to remove any left over moisture. Check your windows for streaks, by looking at them from different angles. The finishing touch: Wipe off the window frames and sills to prevent the water from causing damage. Using these tips will help you do a more efficient and better job…but it may not be a job you want to do.